This effective dietary supplement from Oropharma delivers essential vitamins to your stock for improved fertility and enhanced breeding health. Oropharma Ferti-Oil is a wheat germ oil that has been enriched with a wide range of elements, including vitamins A and D3, selenium, and beta carotene. It also contains unsaturated fatty acids and top-quality lecithin. However, despite these additional properties, this wheat germ oil is perhaps best known as the foodstuff that provides the richest concentrations of vitamin E.
All of these vitamins and minerals combine to promote better breeding. 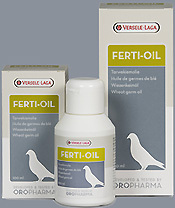 By taking Oropharma Ferti-Oil, pigeons will be at lesser risk of developing unfertilised eggs; they will also benefit from greater endurance and will lay eggs faster in a synchronised manner. Widowers will also experience greater drive and will achieve a higher level of condition. Administer 1 teaspoon of Ferti-Oil per 1kg of grain. To prepare for breeding, administer every day from 8 days before mating until the second egg is lain. For widowers, administer 2 days at the end of the week. The mix must be freshly prepared every day.